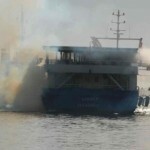 The 42 meter long ferry Sabret caught fire on the Marmara Sea near Istanbul, Turkey. 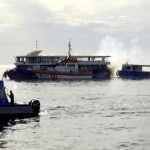 The Sabret was bound for excursion around the Prince Islands with 100 passengers when the fire broke out in the engine room. The fire spewed out dense smoke. The crew requested assistance with several rescue boats, a tug and a ferry responding. 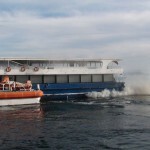 The passengers and crew of the Sabret were transferred to the ferry Caddebostan. The fire was extinguished a short time later. Reports state several passengers suffered smoke inhalation and were taken to hospital for treatment.